If you follow Rewards Canada on Instagram we mentioned sometime ago after a meeting with WestJet Rewards that an exciting promotion will be coming up. We are proud to pass along exclusive advance notice of that promotion that you can start taking advantage of right away! In fact WestJet will not be promoting this offer to their membership base until June 9th! Just another perk of being a Rewards Canada reader you'll get an extra week of reaping the rewards if your travels take you to or through any of these cities! As you can see from the offer details all you really need to is to complete one round trip to/from any of the three cities and you'll earn a bonus. Add in more flights and you'll earn more dollars. Flying on WestJet's new Halifax-Glasgow route? This bonus can be yours too! The more you fly, the more you earn! Be sure to join WestJet Rewards then simply register for the promotion, book your flights, add your WestJet ID to your bookings and you're ready to go. To register for this promotion, please enter your 9-digit WestJet ID. Plus vous voyagez, plus vous accumulez de dollars WestJet! Adhérez à Récompenses WestJet, inscrivez-vous à la promotion, réservez un vol, ajoutez votre ID WestJet à la réservation, et le tour est joué. Pour vous inscrire à cette promotion, veuillez entrer votre ID WestJet à 9 chiffres. To qualify for this bonus offer, you must be a member of WestJet Rewards, register individually for this promotion and book flights to or from select eligible cities between June 3 and August 31, 2015 for travel between June 3 and October 28, 2015. Seasonal start and end dates apply. Enrollment in WestJet Rewards and registration in the promotion prior to flight date(s) is required and your 9-digit WestJet ID must be included on the booking(s). Offer valid on new bookings only. This offer is valid with the purchase of published fares of regularly scheduled flights marketed and operated by WestJet. 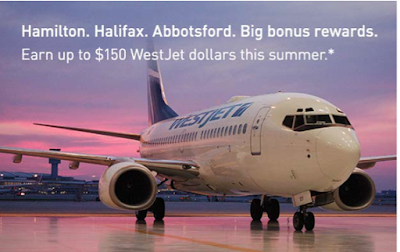 WestJet Vacations bookings, redemption bookings and partner-marketed flights are not eligible for this offer. An eligible flight is defined as any flight to or from Abbotsford; to or from Hamilton; or to or from Halifax. Connecting itineraries including an eligible flight are valid for this promotion. Fly two eligible one-way flights during the promotion period to or from the specified cities and you'll receive a $25 WestJet dollars bonus; after two more one-way flights for a total of four flights to or from the specified cities, receive a $50 WestJet dollars bonus; after two more one-way flights for a total of six flights to or from the specified cities, receive a $75 WestJet dollars bonus. The WestJet dollars bonuses will be awarded on a cumulative basis; you are eligible to receive all three bonuses to a maximum of three bonuses per member with a limit of one of each bonus amount for a total of up to $150 WestJet dollars. Please allow up to 30 days after travel is completed for the bonuses to be processed to your account. Bonus WestJet dollars have no cash value and are subject to current program terms and conditions. All other Program terms and conditions remain in effect. Offer is subject to change without notice. For more information on WestJet Rewards, visit westjet.com/rewards.